Here's how we would play ILMN stock right now. Responding to a caller during the "Lightning Round" of Mad Money Monday night, Jim Cramer said on CRISPR Therapeutics Ag (CRSP) : "It's under pressure in the short term and has promise for the long term. But If you really like that business, you should be in Illumina Inc. (ILMN) ." Let's check out the charts of ILMN. In the daily bar chart of ILMN, below, we can see that buyers have decided to show up around $270 as that level has held in December and again in late January. A pattern of lower highs is still in place from early October but that could be ending soon. Prices are below the declining 50-day moving average line but a close above $300 could break it. The 200-day moving average line is still rising. The daily On-Balance-Volume (OBV) line has been in a decline from early October but an upturn in February could be the end of that decline. In the lower panel we can see higher lows from the 12-day price momentum study. This is a bullish divergence when compared to the equal price lows and tells us that buyers were attracted to ILMN on the second low at $270. In this weekly bar chart of ILMN, below, we can see that prices are below the cresting 40-week moving average line. The weekly OBV line is steady and the MACD oscillator is below the zero line. 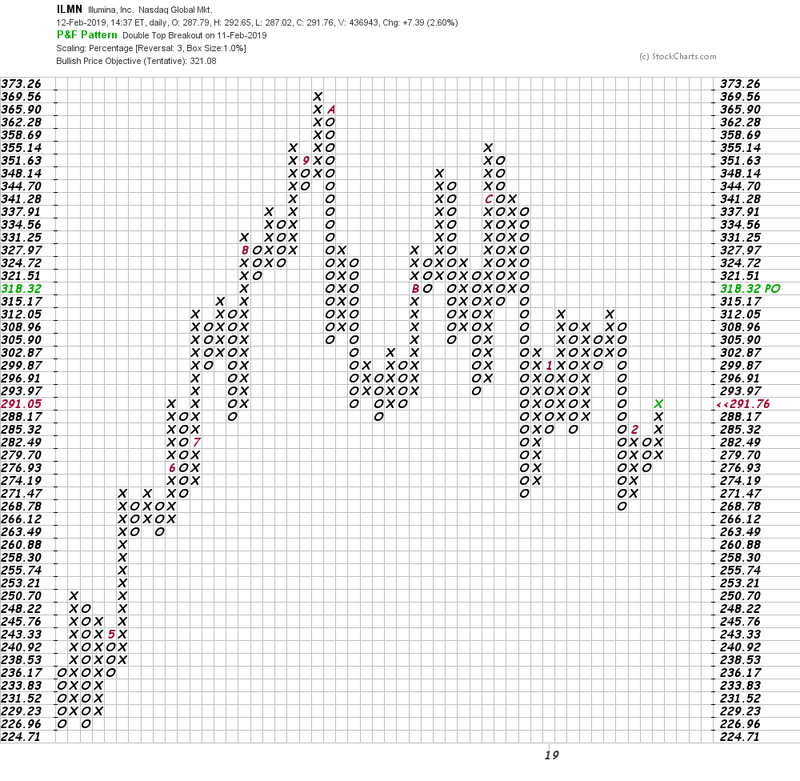 In this Point and Figure chart of ILMN, below, we can see an upside price target of $321. This is obviously not a new high but it is a strong enough move to break the downtrend from October. Bottom-line strategy: Seasoned traders could approach the long side of ILMN here and risk a close below $270. A new low close would mean that the bears were still in control. On the upside we could see a rally to the $320-$330 area in the weeks ahead.